For a while now, I had seen the logo for Sauce, which didn’t exactly inspire me to want to try their food. However, after dining at this bar/restaurant this past Sunday, I think that people shouldn’t judge a place on it’s logo. Urbanspoon’s Android App led us to Sauce on Sunday, which sported a rating in the upper scales of other south hills breakfast options. 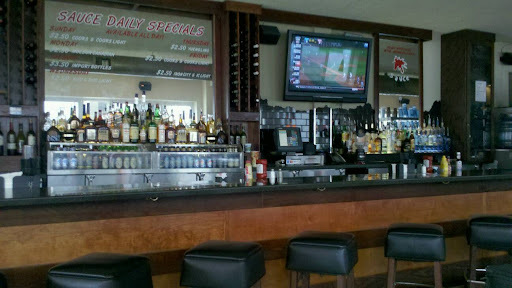 Seeing the specials board and the bar-like atmosphere, I had to resist my urge to order a bloody mary. For breakfast, I ordered the Saucy Egg Sandwich while TasteBudA ordered the Sauce Hot Cakes with Apple Pecan topping. 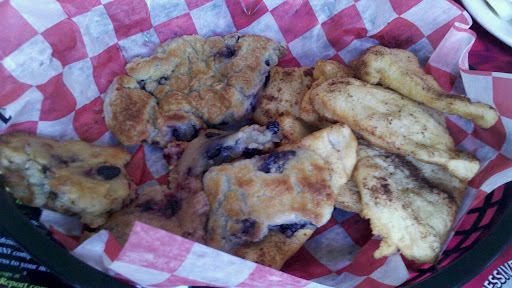 As a precursor to our entree, I ordered the Bridgeville Beignets & Scones, I thought were a great compliment to our coffees and a steal for $4. My sandwich was great. I’ve never seen a restaurant approach an egg sandwich like a hamburger, but I dig it! 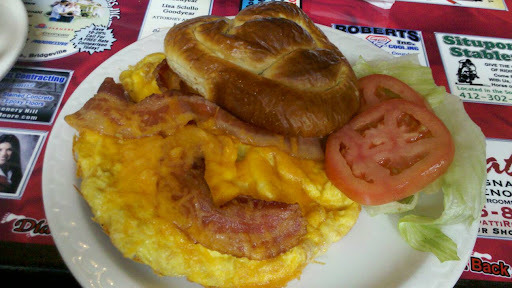 Served on a pretzel roll, this egg sandwich had both cheese and bacon topped with lettuce and tomato. My only comment to the waitress after eating was I wish I’d have thought to ask for a slice of raw onion to add to the sandwich. Based on the menu item names, it appears they even enjoy calling things that don’t have a sauce “Saucy,” perhaps going for irony. 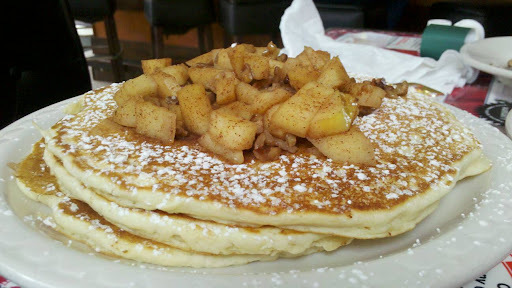 TasteBudA said his meal was okay, but felt the stack pancake was heavy and the apples should have been cooked more to soften them. He didn’t find it overly exciting, but didn’t complain too much either. Previous Looking for Pittsburgh’s Best Gyro!